The weather isn’t cooperating, but we’re not cancelling yet. Comments Off on The weather isn’t cooperating, but we’re not cancelling yet. Tomorrow’s Pike District Promenade has only an 89% chance of being rained out (according to my weather app) so we’re not cancelling … yet. If the weather predictions turn out to be wrong (fingers crossed! 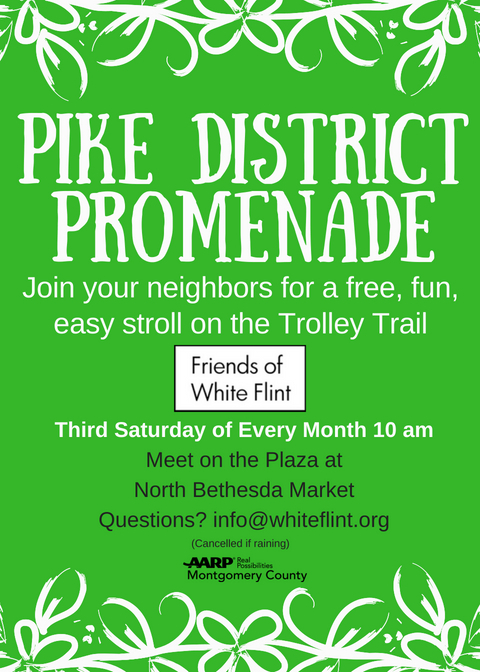 ), we’ll meet tomorrow, Saturday December 15, at 10 am at the North Bethesda Market plaza for a wonderful, easy stroll along the Trolley Trail. Check www.whiteflint.org, Facebook, or Twitter tomorrow morning to see if we’ll be promenading in the Pike District.